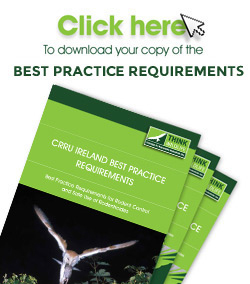 The Campaign for Responsible Rodenticide Use Ireland (CRRU Ireland) is a company limited by guarantee set up to promote through a campaign the responsible use of the second generation rodenticides in Ireland (Company No. 533136). 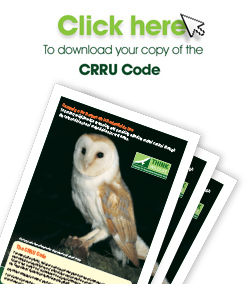 To achieve this CRRU and CRRU Ireland have drawn up a code with pictograms (the Code) for the responsible use of rodenticides as shown HERE. CRRU has applied to have the ‘Think wildlife’ logo (the Campaign Logo) as shown HERE registered as a European Union trademark. CRRU Ireland has resolved that the members may use the logo subject to the conditions contained herein. CRRU Ireland hereby grants to the Licensee and the Licensee hereby accepts, a European wide, non-exclusive, non–transferable, royalty–free licence to use the Code and the Campaign Logo in connection with the promotion and advertising of the Campaign and in the form and manner prescribed in this Agreement, as may be amended from time to time by CRRU Ireland. The Licensee shall not assign, transfer or sublicense this Agreement (or any right granted herein) in any manner without prior written consent from the Licensor. The Licensee acknowledges CRRU’s exclusive rights of ownership of the Code and Campaign Logo and all the associated goodwill and that CRRU retains all right, title, and interest in and to the Code and Campaign Logo. The Licensee shall not register or authorize third parties to register or attempt to register as a trade mark service mark or otherwise the Campaign Logo or any marks, names signs words or symbols similar thereto or do any act or thing directly or indirectly in derogation of CRRU’s exclusive ownership rights in the Campaign Logo or which could damage or impair the reputation and goodwill symbolized by the Campaign Logo and CRRU’s exclusive rights of ownership therein. The Licensee will not adopt or use any corporate name trade name trademark domain name service mark or certification mark or other designation that infringes CRRU’s rights in the Campaign Logo. The Licensee shall take all reasonable steps to notify CRRU Ireland of any suspected infringement of or challenge to CRRU’s rights in the Campaign Logo of which the Licensee is aware. CRRU shall have the sole right to, and in its sole discretion may control any action concerning the Campaign Logo. The Licensee shall use the Code and Campaign Logo only in the form and manner specified by CRRU Ireland as may be varied from time to time. The integrity of all elements of the Campaign Logo must be maintained including the colour of the Campaign Logo which is the preferred way of reproducing the Campaign Logo. The Licensee must use the Campaign Logo artwork as provided. The colour values may not be altered. (ii) termination as provided herein. Upon the expiration or termination of this Agreement for whatever reason the Licensee shall cease immediately all use of the logo and shall have no further rights to use the Campaign Logo except as otherwise specified under this paragraph. For the avoidance of doubt the Licensee may continue to use materials and packaging incorporating the logo in existence at the date of termination but shall not incorporate the logo in any new materials. The Licensee may not assign any of its rights or delegate any of its duties under this Agreement without the prior written consent of CRRU Ireland and provided that such assignment is not otherwise contrary to law. The Licensee shall indemnify CRRU and CRRU Ireland against all actions claims costs damages and expenses which it may suffer or sustain as a result of the actions of the Licensee. CRRU Ireland shall indemnify the Licensee against all actions claims costs damages and expenses arising out of the Licensee’s use of the Intellectual Property in accordance with the terms of this Agreement. No waiver by CRRU Ireland of any of the Licensee’s obligations under this Agreement shall be deemed effective unless made by CRRU Ireland in writing, nor shall any waiver granted by CRRU Ireland in respect of any breach be deemed to constitute a waiver of or consent to any subsequent breach by the Licensee of their obligations. To the extent permitted by law, all provisions of the Agreement shall be severable and no provision shall be affected by the invalidity of any other provision. (iv) By email transmission, receipt confirmed, the next business day following that on which the message was sent. The Licensee’s obligations shall be excused to the extent that its performance is prevented by war, fire, strike, flood or other natural disaster or other similar event beyond the control of the Licensee. In such an event the obligations of the Licensee shall be suspended for such time as the performance thereof is thereby prevented. CRRU Ireland makes no warranties with respect to the Campaign Logo and disclaims all warranties that might otherwise be implied by law. This Agreement shall be governed by the Law of Ireland and the parties agree to submit to the exclusive jurisdiction of the Irish Courts. YOU HAVE READ THE TERMS OF THE LICENSE AND AGREE TO BE BOUND BY THE TERMS OF THIS AGREEMENT VIA A TICK BOX OF THE WEBSITE. BY ACCEPTING THE TERMS YOU ARE ENTERING IN TO A LEGALLY BINDING AGREEMENT.